WATS is rolling out a redesign of its website! The new design attempts to simplify access to important documents for the public and local elected officials. View a screenshot and markup of the new homepage below. The design will allow us to highlight what opportunities are available for public participation, and will integrate the blog into the site as well. WATS will continue to crosspost to the old blog at Blogger. 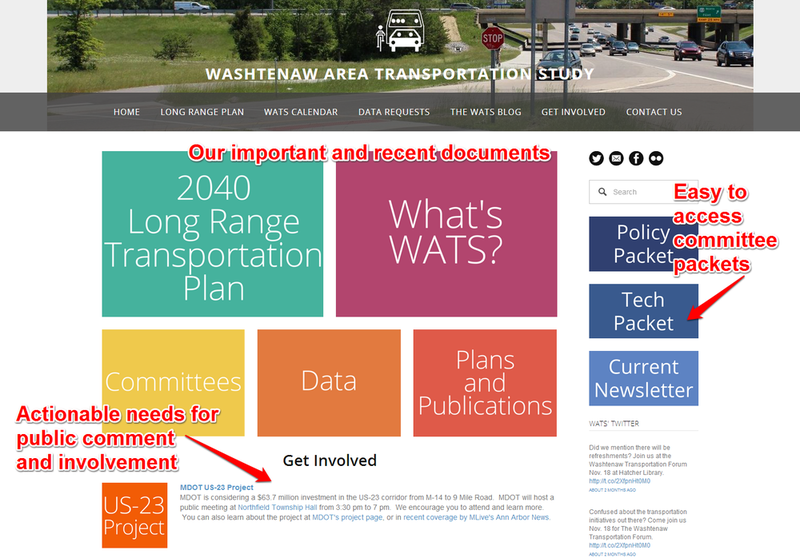 Since the new website was designed and created by WATS staff, if you have any thoughts or comments, we would be happy to consider integrating them. We hope you like the new site, and are excited about the opportunities that a enhanced yet simplified web presence provides. Visit www.miwats.org to see the new site. If it doesn't display yet, check back in a day or two!